[Updated] The 2012 Hurricane Season is off to an early start, with Tropical Storm Alberto — the first named storm of the season — forming today [May 19]. The Miami-based National Hurricane Center [NHC] said that Alberto is about 140 miles off Charleston South Carolina, and has sustained winds of more than 40 mph, with gusts at nearly 60 mph. The projections issued by the NHC at this time do not indicate the system will pass close to Bermuda. We are under two weeks away from the official start of the 2012 Atlantic hurricane season, which starts on June 1st and runs until November 30th. 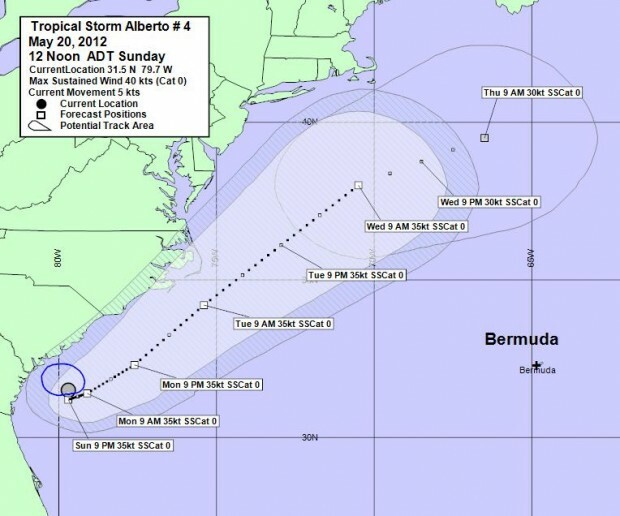 Update May 20: The Bermuda Weather Service said that Alberto is not a threat to Bermuda at this time, and its closest point of approach to Bermuda within 72 hrs is forecast to be 435 nautical miles to the north west at 12pm on Wednesday May 23, 2012. Should govt. put Works and Entertainment on alert, with a view to start barricading the causeway??? Will there be a press conference at Blue Hole Hill???? I don’t know if this is good or bad for Bermuda but this storm started 92 miles off the coast of Savanna Georgia & not off the Cape Of Africa as they normally do. Last year storms where starting in the caribbean sea which was abnormal enough but this is crazy. I guess a good point is by the time they reach Bermuda they won’t have had time to pick up full category strength as long as they don’t start doing loop de loops like the ones on other planets do. Either way this can’t be a good sign for the environment with a change so drastic. This must have something to do with the bp spill. Typically , early season tropical storms form to our south west and off the east coast of the US. As the season wears on the general formation pattern moves to our south east and then off the west coast of Africa. At the end of the season the formation pattern tends to move back to our south and the Gulf of Mexico again. Tommy , this is perfectly normal for early season activity . Exactly how long have you been tracking tropical storms ? ? I need a rum after that one Tommy. Have sheppards pie instead of blood pudding. Tropical Storm Ana first of 2009 Started off of Cape Verde Next one for 2009 Hurricane Bill starts off of the western coast of Africa.